THE anti-gay ideology that has long held sway in American evangelicalism seems to be crumbling. Conservatives’ insistence that the Bible proscribes homosexual acts and their claim that protecting gay rights infringes on their own religious liberty have depended on another assumption not found in Scripture: that homosexuality is not a biologically rooted identity but a sinful temptation, an addiction that one must control.The noisy backlash against the Supreme Court’s legalization of gay marriage cannot mask the signs that this assumption is losing its grip. The most conspicuous indication that something is changing came in 2013 while Obergefell v. Hodges was still working its way up to the court. Alan Chambers, the president of the “ex-gay” ministry Exodus International, apologized to L.G.B.T. people for causing them “pain and hurt” and shut down his organization. 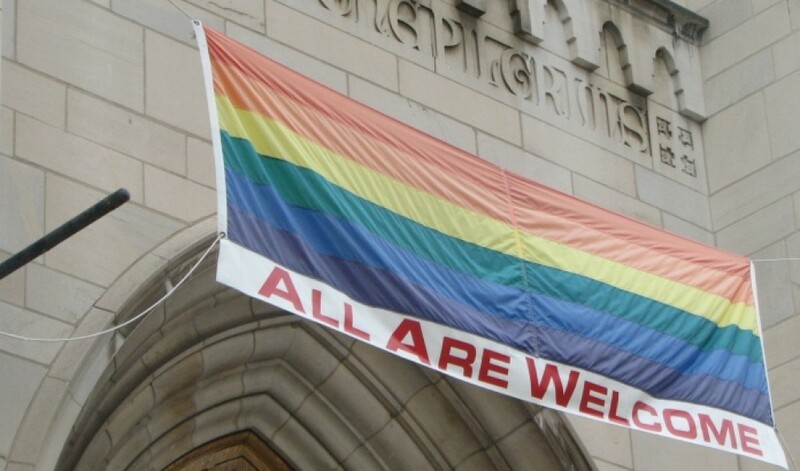 The LGBT rights movement — so the story goes — has split the Christian churches in two. On one side are the progressives, who believe that Christianity should accept gay people and recognise gay marriage. Lined up against them are the conservatives, who hold fast to the belief that being gay is sinful. It’s not entirely false, that story. There are just a vast number of Christians who don’t fit into it. Readers of Queering the Church, and of Queer Church News, will not need to be told that queer Christians exist, know that there is no inherent conflict between faith and their sexuality or gender identity, and that we have a continuously expanding number of straight allies in faith. That’s why my site exists, and is a message I am constantly promoting. Now Dan Savage, creator of the “It Gets Better Video Project” has got the message, and given his backing to video project inspired by It Gets Better, to express Christian support for the LGBT community. Now some Christians have taken Savage’s challenge — and even adopted his title. Christian blogger John Shore and Wayne Besen, from Truth Wins Out, with the blessing and support of Savage, have launched NALT, The Not All Christians Are Like That Project. Based on the format of the “It Gets Better” campaign, the website launched on September 4th as a platform for Christians who want to send a direct message of welcome and acceptance to the LGBT community. St Martin’s Hall, Lower Crypt. A lecture by hosted by St Martin-in-the-Fields and by Open Table, the Greater London Changing Attitude Group, to address issues currently debated in Church and society. All are very warmly welcome to this open lecture. The evening will be chaired by Revd Clare Herbert, and will include responses and questions from the floor.